On Wednesday Apple announced that HBO Go and WatchESPN (and a few other content providers) had made their way to the Apple TV. This is exactly the kind of content I've been praying Apple would acquire for its diminutive $99 set-top box. My dreams of finally catching up on The Wire, The Sopranos, and The Newsroom from the comfort of my bed (across from which sits a small HDTV and an Apple TV) were finally fulfilled. Sensing I had made a mistake, I toggled back and forth between the two screens. After all, as a DirecTV subscriber I have no problem accessing HBO Go on my iPad. Surely the company couldn't be so terrified of set-top boxes that it offered this service on mobile devices but not on a device hooked directly to my television. Please be advised that although we don't currently allow HBO streaming on Roku we forwarded your request to DIRECTV Management for review. Be assured your feedback is important to us and we often make changes based on our viewer's comments. With this, please note that we currently offer the HBO Go service on smartphones, tablets, and PCs and we will continue to evaluate ways to enhance the services we offer. We are also working to improve and enhance our HBO On Demand in the coming months to offer customers wider access to HBO current and past content. 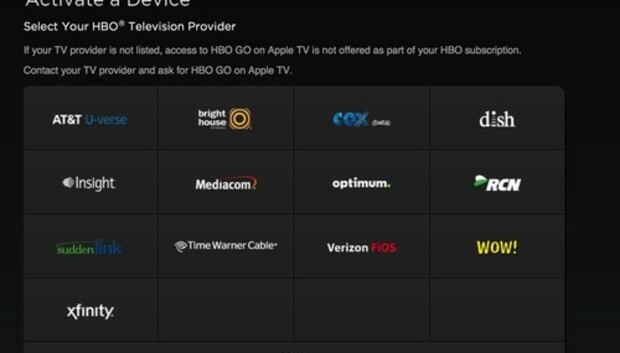 @BodyofBreen We have supported HBO GO for some time now, Apple TV app for HBO GO was just announced today, from what I can find about it. And this is DirecTV's solution. Purchase a $400 device so you can stream pixelated and often-choppy HBO programming to your television. Clearly this makes me unhappy. But let's move beyond my personal grief to a broader point. And that point is that DirecTV is just one example of an industry that learned very little from the digital music wars of the last decade. If you recall, when digital music hit the mainstream in a serious way (and for convenience let's call this the iPod Era), the music industry did everything in its power to hang on to the Old Way. It pursued copy-protection schemes that inconvenienced customers, sued those who shared music, dangled a toe or two in its own online music services, and pushed for legislation to protect its interests. Ultimately, these measure did nothing and the delay in embracing and controlling new distribution models ultimately left the industry in a more vulnerable position--to the point where a company like Apple could sweep in and dictate terms (let's call this the iTunes Era). Fast-forward to today and you find TV providers pursuing a similar course. Subscribers are chained to long-term contracts, ala carte service is resisted at every turn, cable operators combine Internet and TV services to protect their programming, services like Hulu are hobbled by commercials and incomplete programming, content is locked to devices, and providers like DirecTV pick and choose which devices can play particular networks. Is it any wonder that Netflix is gaining popularity? And it and other similar schemes are because many of us have grown weary of policies put in place not to serve customers, but to protect the interests of providers. Subscription TV is expensive, but it's an expense that many will bear as long as it appears that providers are making an effort to take advantage of existing technologies. Fail to do so and customers seek a way out. For my sake as well as yours, DIRECTV Management, I hope you'll take this to heart.